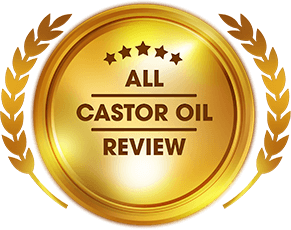 Editor’s Note: This post has been updated with additional information under the section, Using the Castor Oil. Hi everyone, Michelle here. I’ve been using a new brand of castor oil for two weeks now and it’s called Valentia Castor Oil. 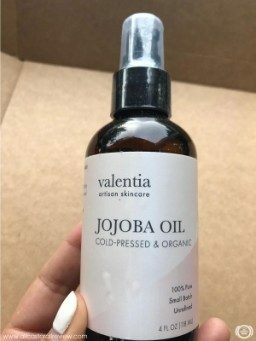 I’ve heard good reviews about this product and I was lucky enough to get it as a set with jojoba oil and rose water so I was really excited to use them. 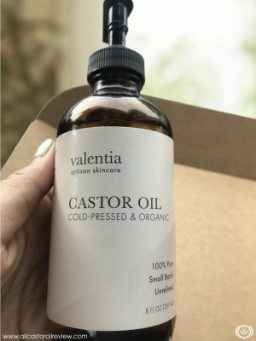 Valentia castor oil made it into my list of must-try castor oil products. If you want to know how I used castor oil with jojoba oil and rose water, keep reading! 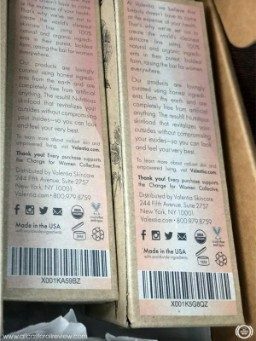 Valentia Castor Oil’s product packaging is one of the prettiest I’ve seen. It came in a sturdy box with tissue paper sheets that cushioned the three boxes containing castor oil, jojoba oil, and rose water. Each of the different product packagings has designs that make it different from the others. The front has a pinkish color just like the back of the box. 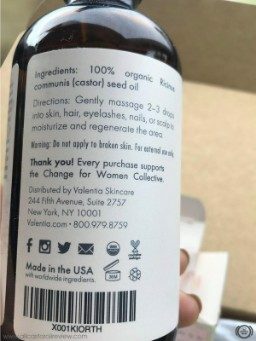 On one side, you can see the list of ingredients and other important reasons to buy the product. On the other side is a wonderful flower design. 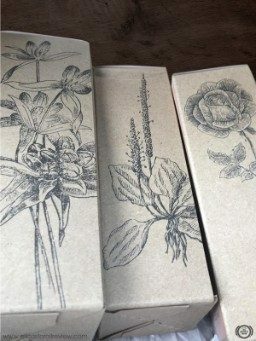 There is a quote printed at the top of the box and when I opened it, I was greeted with a faded flower design similar to the one on the outside of the box. The glass bottle sits safely inside the box. What I liked about it is that the bottle is made of amber glass. It also comes with a pump, which makes it easier for me to dispense the oil. The jojoba oil comes with a spout dispenser while the rosewater has a spray bottle. Even the minimalist labels of the products are beautiful. They are easy to read and have complete information. Now, I wonder if its effects are as wonderful as its packaging. It has a subtle nutty and earthy scent, which almost smells like almonds. The castor oil bottle’s pump dispenser is so easy to use. Compared to the spout, it isn’t as messy when I use it. This oil is very thick but it doesn’t feel sticky. It has great consistency when I rub it between my palms. I pumped twice to get a good amount of oil on my hands and saw that the oil has a golden yellow color. It has a subtle nutty and earthy scent, which almost smells like almonds. I noticed that it absorbs quickly and that it did not leave any oily residue. My favorite part of this whole experience was using rose water with castor oil as a pre-shave. Since the castor oil came with two other products, I thought that I’d try them both with castor oil. But first, I want to see the benefits of using castor oil alone. The same day that the product arrived, I applied the oil to my eyelashes. The package didn’t have any applicator so I used one from my stash of applicators. I dipped it in the bottle and removed the excess oil. Remember guys, you need to remove the excess oil or it will seep into your eyes. I used the eyelash brush and applied it to my lash line. You may wonder why I do this instead of using a mascara wand and applying the oil directly to my lashes. Applying the oil directly to where the follicles are, stimulates them so the strands grow longer, stronger, and thicker. I did this every night for two weeks. Yes, it takes time and effort to see results. Next, I tried the combination of castor oil and jojoba oil for my hair care routine. I only tried this two times in two weeks, but I can tell that it has great benefits for my hair. I mixed equal parts castor oil and jojoba oil. Two tablespoons each is enough to cover the entire length of my hair. I applied them all over and paid special attention to my frayed ends. Then, I wrapped my hair in a shower cap and left it for 20 minutes. I washed the oil off my hair using a mixture of equal parts castor oil and shampoo. This mixture does not produce as much foam compared to when I’m just using shampoo, but it feels smoother and moisturizing. This helps prevent your hair from becoming dry and rough after washing too. It was amazing how my hair felt really soft and smooth after! This recipe worked for me because it isn’t too thick or foamy like chemical-based shaving creams. You can also skip using jojoba oil and just use four tablespoons of castor oil instead. Mix all the ingredients and apply it before and during the process. I was so delighted when I used this mixture that I’m now convincing Marc to try it once. He said he’d try it once he’s used up all his shaving cream. Update: Marc tried the product as a pre-shave. He liked how his skin felt after he shaved. Compared to shaving cream, this pre-shave is definitely gentler on his skin. When Marc shaves, his skin tends to get red and irritated. He gets razor burn and acne breakout under the jaw too. Using the pre-shave actually worked well to keep his skin smooth and soft. He said that the oil and rosewater mixture made it easier to shave without getting nicked. He made me touch his jaw and neck after he shaved and it was so soft like a baby’s bottom! It felt smooth too. Marc didn’t mind that the pre-shave smelled like a mix of nuts and rose. My boyfriend said that the smell was soothing for him. The oil is so versatile that you can use it in various ways whether it’s for skin, hair, scalp, eyelashes, and even nails. 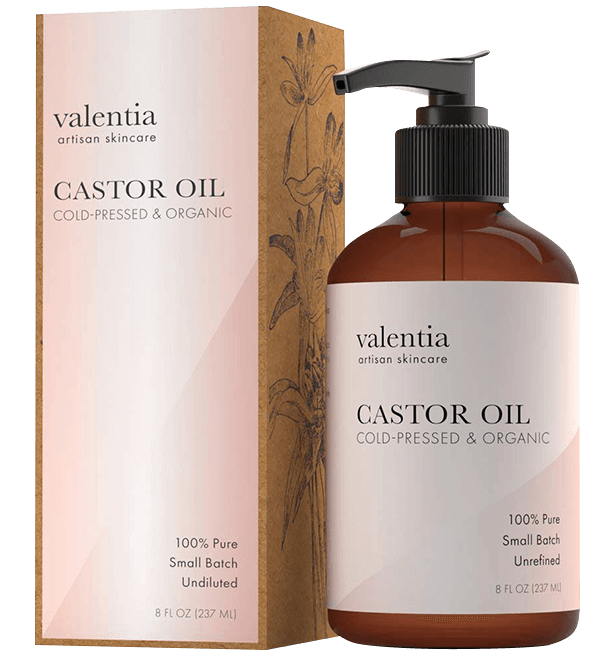 I love its packaging and I definitely love Valentia castor oil. Two weeks is such a short time to use the oil on my eyelashes, but it made a difference. The oil is so versatile that you can use it in various ways. Castor oil has benefits for skin, hair, scalp, eyelashes, and even nails. You can mix it with other oils or products too. 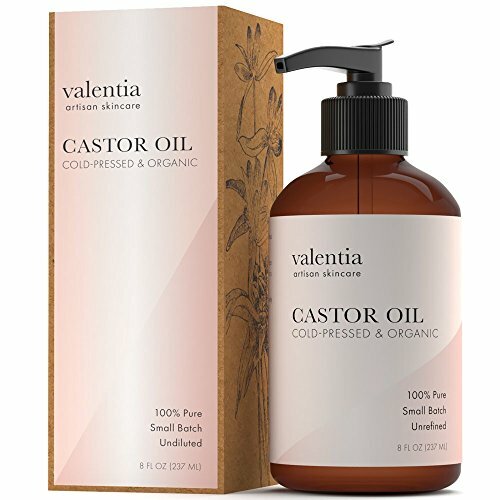 If you want an all-around product that can give you results, Valentia castor oil is a great choice. 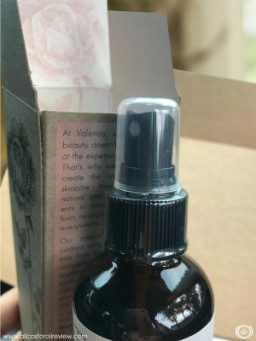 Valentia offers you natural skin care products that make you look and feel good. Each product is made from high-quality ingredients and free of any harmful chemicals such as artificial preservatives. 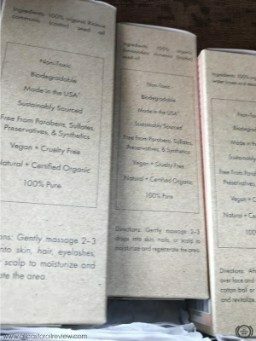 They believe that your body deserves toxic-free skin and hair care products that don’t put your health at risk. 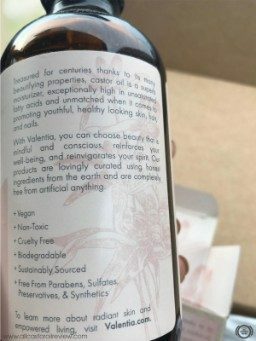 Valentia Artisan Skincare offers money back guarantee. If you are not completely satisfied with your purchase, you can get a refund or replace your bottle. They also offer free shipping for orders over $49. Valentia stays on top of their game by providing quality service as well. For any questions or complaints, you can reach out to their team any time of the day. Oil came in an amber glass bottle and comes with a pump dispenser. Oil has a thick consistency, golden yellow color, and a subtle nutty scent. Used it to make my eyelashes look shinier. Worked great for skin and hair. Free shipping for orders above $49. Money back guarantee.